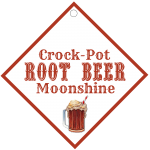 If you like root beer you are going LOVE this alcoholic adult beverage recipe for Crock-Pot Root Beer Moonshine! Everclear grain alcohol or vodka is sweetened and flavored with root beer extract for this perfect sipping flavored “moonshine” recipe! This is the first installment on an alcoholic beverage recipe each month. While I call these “moonshine”, they really are a Everclear grain alcohol or vodka based mixed cocktail drink. The word moonshine is just to suggest that the drink is a very strong alcoholic drink. The alcohol itself takes on the flavor of the other ingredients masking the true alcohol content. With all of that said, lets get on to our first drink for the year. 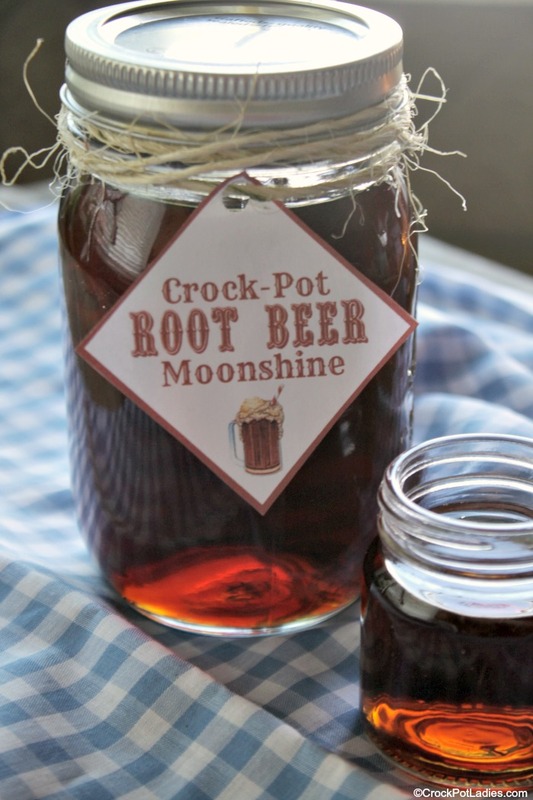 Crock-Pot Root Beer Moonshine!!! A couple years back, I was introduced to root beer beer. That is, root beer flavored beer that has a sweet flavor of my favorite soda. 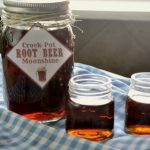 Why not make a root beer moonshine drink that has all the flavors and tastes associated with my favorite soda and beer? I used Hires Big H Root Beer Extract to make this recipe. I did have to order this product off Amazon but I am sure you should be able to find a similar product in a grocery store or maybe even a health food store. Add the water, white sugar, brown sugar and pure vanilla extract to the slow cooker. Heat the liquid on HIGH for 2 hours. You want the sugars mixed in with the liquid so they are no longer gritty. Turn off the slow cooker and add in the root beer extract and stir well. Allow the liquid to cool completely and then add in the Everclear grain alcohol (or vodka). Now, this recipe does call for 1 Liter of Everclear grain alcohol. But, you can decide how much alcohol you want in this drink. Using vodka will lower the alcohol percentage in the drink or using half of the bottle instead of a full bottle of Everclear (or even the vodka). You will not take away from the drink taste by adding less alcohol. This recipe made almost 4 quarts of Crock-Pot Root Beer Moonshine. Add lids and rings to the jars and store in a cool dry place for a minimum of 7 days before you drink it. However you can store it pretty much for ever. The longer you store it, the more the alcohol will take on the taste of the root beer. You will taste less alcohol. Before drinking, make sure to give the jar a good shake! As a bonus we have created a FREE printable for cute little labels that you can print out at home and tie onto your mason jars. Making this a cute little gift to give away to friends. To gain access to the printable labels simply subscribe to our email newsletter and you will receive information on how to get your free printable labels! 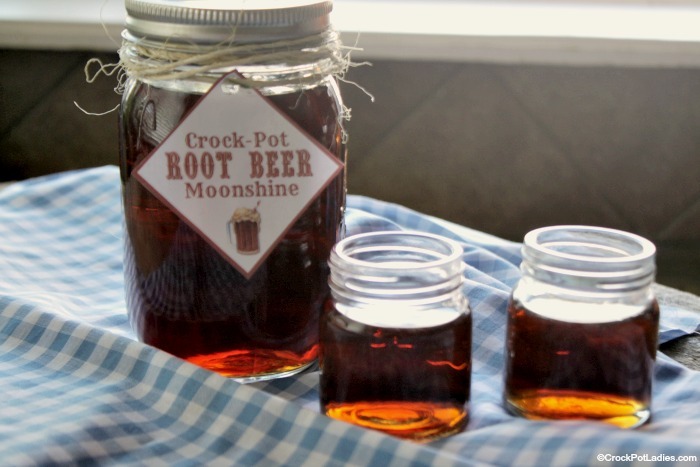 This root beer flavored "moonshine" recipe tastes amazing. Sip away on it in small doses though as it is strong! 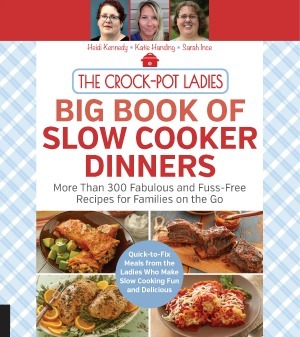 Add water, granulated sugar, brown sugar and pure vanilla extract to a 4 quart or larger slow cooker. Cover and cook on HIGH for 2 hours, stirring occasionally. Turn off or unplug the slow cooker and stir in the root beer extract. Allow the liquid to cool completely and then mix in the everclear or vodka. Ladle mixture into clean canning jars with lids and rings in a cool dark place. I cannot find root beer extract, can you use root beer concentrate? Hi Bruce, we have not tested this recipe using root beer concentrate. It looks like root beer concentrate is a syrup and has added sugar. I think you might be able to use it but you would have to adjust the sugar in the recipe otherwise it will be super sweet. I found my Root Beer Extract at a local spice shop. We made this recipe and love it. Everyone that has tasted it loves it as well. Thanks for letting others know where they might look for some root beer extract Linda. A local spice shop sounds AMAZING! Have this in the crockpot heating now. Does this need refrigerated once jarred? It does not need to be refrigerated. The high sugar and alcohol content will prevent it from spoiling. You can however store it in the refrigerator if you like to drink it chilled. Does this method work with any other extracts instead of root beer? Yes you can use other extracts…go for it and be creative! Do you seal the jars before storing them for long periods of time or do u just screw the lids/rings extra tight? I’m thinking about making this now and storing until Thanksgiving so that I dont forget to make it ahead of time but I want to b sure to store it correctly! Just screw the lids on really tight. Can I use a sugar substitute, like Stevia, instead of regular sugar? Will it taste and store the same way? I don’t think a sugar substitute will work very well in this recipe. This recipe has not been tested using one and I am not sure how it will store. Hi Tim, ladling mixture means just that, use a ladle to spoon the mixture into the jars. If you have a sturdy hand you can of course just pour the mixture into your jars. But using a ladle is easier to get it in there without spilling it all over the place. Have you tried making a butterscotch shine? We have not but that sounds great! May have to put that on the old “to-do” list! Thanks for the idea Alan! Just made it. Skipped the crock pot and used the stove instead. Also used Watkins root beer concentrate I got from Walmart. It don’t have extra sugar and I used double the amount in the recipe. That was basically what the directions on the concentrate called for. A bit sweet but very good. Needs to sit a while and age as I just finished it and only sipped the little left from putting into jars to try it. Also I cut the original recipe in half for a trial run. Thank you for posting this. You’re welcome Shane, so glad you enjoyed the recipe! Hi…so how root beer concentrate did you actually use for half the recipe? I’d like to try it! Thank you! Ho thanks for the recipe, can you please tell me what the final alcohol percentage is? The final alcohol percentage will be whatever percentage of alcohol you use. So actual EverClear will be more than Vodka. I just made a batch using your recipe but substitute the root beer for butterscotch extract and it’s awesome!!! I made the Root beer using whip cream vodka and oh my it turned out great.. I found my Root beer extract at Walmart.. Everywhere else I looked in Salem OR did not have it. Could I just use plain old moonshine instead of vodka? You can indeed if you have access to actual moonshine! Be sure to come on back Randa and let us know how it turns out for you! A serving size is a shot (about 1.5 fluid ounces). What’s the best way to serve this? Do you mix the finished product with anything or drink it straight as a shot? If you bottled this with a proper bottle cap how long do you think it would last? This should last pretty much forever as there really are no ingredients in it that will spoil. I think it should be okay to add more root beer extract after the batch has been made. If I make this with 190 proof everclear, what is the alcohol content? Probably close to 190 proof. The proof is going to be pretty close to the proof of alcohol you use since the alcohol is not cooked off any. Curious. I’m putting this in pint jars. Do you think it would be okay to put one or two of those Dad’s root beer barrels, the hard candy, in each jar? Will it totally dissolve? I guess if not I can strain each jar through a sieve, right? Great question Barb, I think the candy may dissolve in the liquid over time. But I don’t think it would harm the flavor at all so if it does dissolve no harm no foul.